THERE IS A COMMON saying about politicians, that goes as follows..’How do you know when a politician is telling lies?’…the answer is ..’As soon as the politician opens his or her mouth, its all lies that follow’. Sadly that seems to hold water as the motor mouth MDC-T, leader Nelson Chamisa has effectively grabbed power to lead MDC T, and is continuously hell bent on unleashing a string of clearly immature promises to the electorate after that including, the latest being Nelson Chamisa promising Murambinda people that he will turn Murambinda growth point into a city if voted into power in July 2018, starting with turning Murambinda mission hospital into a General hospital and tarring the 122km highway from Murambinda to Birchenough Bridge. He has also been caught up in falsely claiming he had been personally invited to the United Kingdom by Queen Elizabeth II. Zimbabweans have lived through endless lies for 37 years by Mugabe and its folly to succumb to the same rubbish under MDC T or any opposition for that matter. www.newzimbabwevision, prides itself in being non partisan and ready to disseminate all information to the progressive public irrespective of whether its about Zanu pf, MDCT or any opposition, so, while many people may dislike the truth,..we thrive on publishing it and leaving it to the people to make more informed decisions in their choices and votes, as we are not here to please any side,..whatsoever! The latest news doing the rounds is that, the leader of a faction of the MDC-T, Adv Nelson Chamisa, has once again been caught out lying to the nation, this time after claiming he had been personally invited to the United Kingdom by Queen Elizabeth II. An official at the British Embassy in Zimbabwedismissed the claim that Mr Chamisa made to supporters in Harare South. Recently, we warned,on www.newzimbabwevision.com that the MDC T is now becoming a laughing stock because of the childish promises made by Nelson Chamisa. Without reverting back to the endless promises, let me summarise them as follows. Nelson Chamisa promises to build rural airports, sphaghetti type roads, bullet trains, Ndebele king and to install WIFI at each rural homestead, claiming “Even goats will be able to have access to the mobile network,”. “Wherever one is, even if they are in their own house or at their small house, then they will be able to access mobile networks.”-wake up Zimbabwe! Small house is the term used by Zimbabwe to refer to extra marital affairs and raises the question again about, what MDC T represents to the people, as Chamisa inadvertently lent credence to immorality through extramarital affairs when he uttered this. 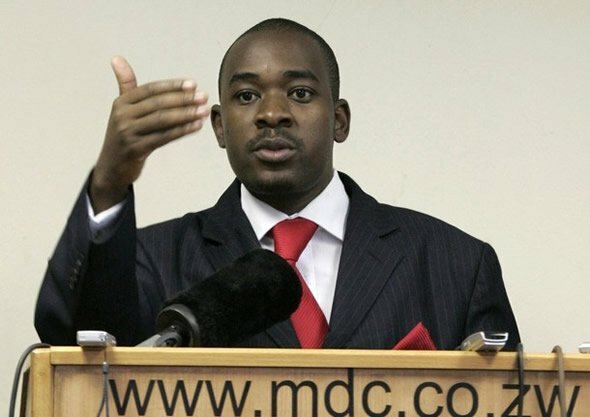 Remember earlier this year, Nelson Chamisa and Tendai Biti, led a delegation to the US to call for Sanctions on Zimbabwe to be maintained.On return , he claimed that they had been promised billions if the MDC Alliance won the harmonised 2018 election. He was forced to issue an apology to the US after the US denied making such a financial pledge to Chamisa. Anyway, the childish utterances have actually become a talking point for Mnangagwa, Chiwenga, Zanu pf stalwarts and securocrats. Chiwenga said the election campaign launch was the first step in the dismantling of MDC Alliance’s “make-believe dreams”. I wonder what he will be saying next, but he is building, adamaging profile, because he will be held to account for all his claims and promises. Media, diaspora exposure and freedom, mean that Zimbabweans are no longer the easy to brainwash, fearful people under Mugabe, and can now challenge leaders and hold them accountable for all their promises, so, while Chamisa may take his childish promises as having no impact, the opposite is true, because the electorate and the opposition Zanu pf , clearly begin to see a shallow minded leader, who takes them for fools. Wake up Zimbabwe,..vote wisely!